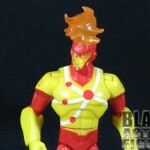 Fun fact: I’ve had a Firestorm action figure made by DC Collectibles (or DC Direct as they were called at the time) waiting in the wings to review for years now. I just haven’t had time to review it and so many other figures seemed review worthy. Now we get a worthy entry during the DC Total Heroes Week Month Time Period. This figure covers all the basis. 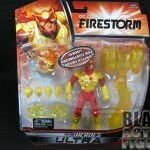 Those who love Ronnie Raymond as Firestorm. Those who love Jason Rusch as Firestorm. Those who like to keep their Firestorm ambiguous. And even those who dig the disembodied head. It’s all here to enjoy! 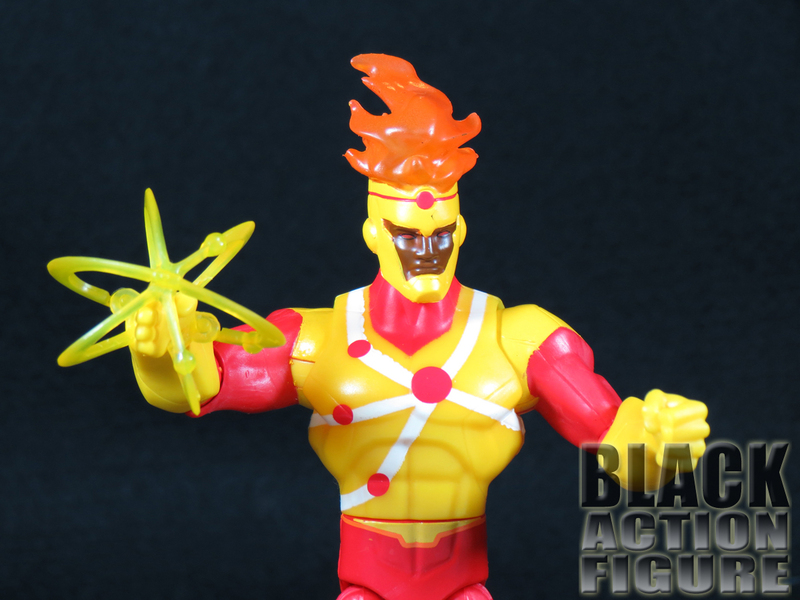 Sit back and enjoy the awesomeness that is Firestorm! I was all excited after seeing the Cyborg box…I thought “from now on, no more plain DC boxes.” Foolish me. 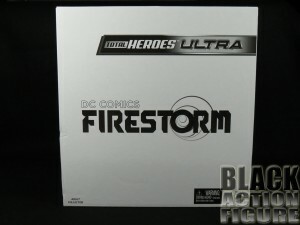 The Cyborg Total Heroes box was obviously part of the SDCC exclusive portion. Back to the White boxes. This one is not so bad. 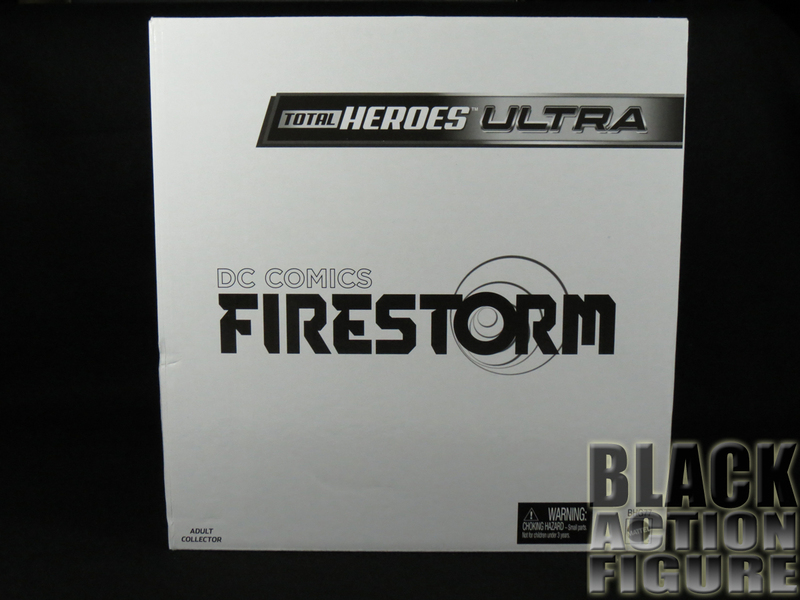 The ‘Firestorm’ logo takes up most of the front so at least it takes some of the plainness out of the simple white. Oh, and no more collector oriented action figure packaging. As soon as I opened the white box I saw that Mattel went from the awesome packaging of the Cyborg figure to the mundane packaging of all the rest of this line. Meaning back to blister bubble with a card back. To add insult to injury, if you look at the picture on the right, you see that the title pieces on the front of the packaging has shifted during shipment. Oh well for mint-on-card, let’s rip into this thing. The card back itself is nice and I can see this figure maybe selling at retail on the merits of the front of the card itself. Almost reminiscent of the Marvel Universe card backs. And something about the color of fire (red, gold, yellow) that draws your eyes to it. Getting back to the packaging, the back has great pictures of all three heads that come with this figure, including a Ronnie head, a Jason head, a “combined” head, and even a ghostly attachment of Professor Stein (more of that in the accessories). 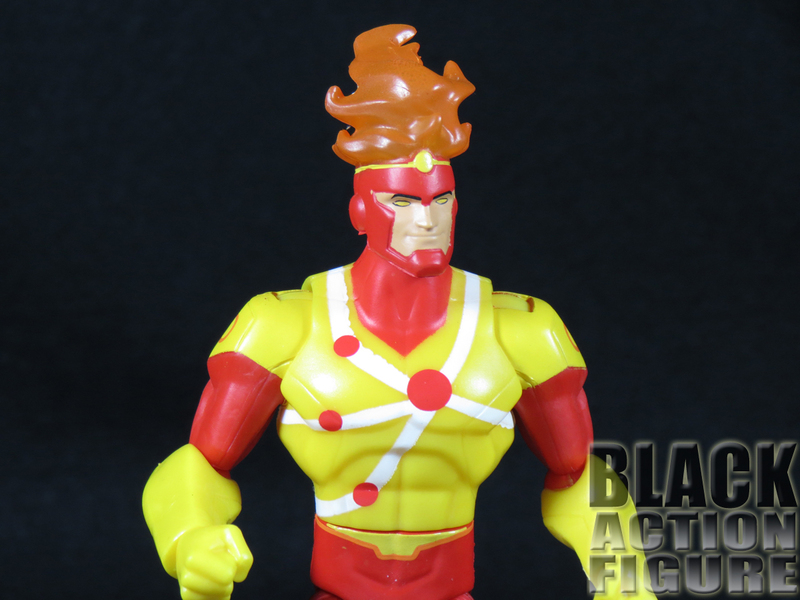 Like most of the Total Heroes Ultra line, this figure comes with a pretty good amount of accessories, although I do have some gripes. 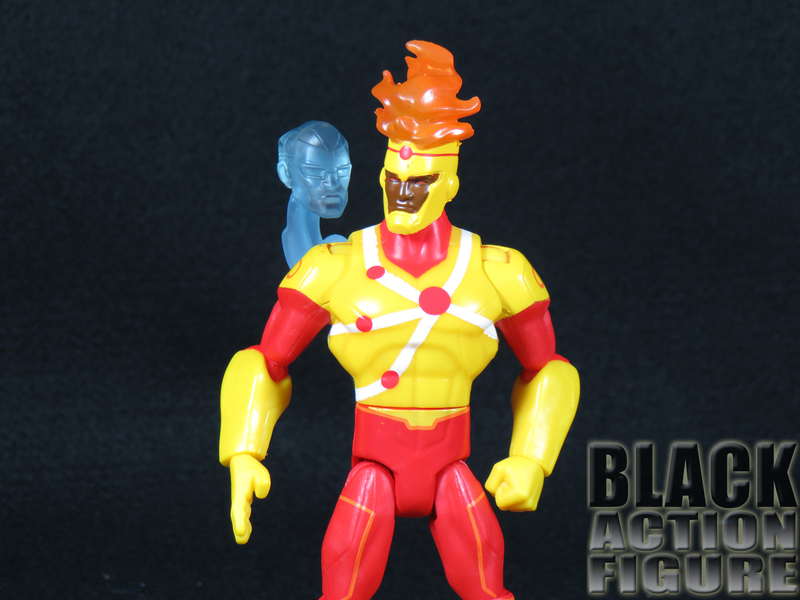 Like I already mentioned, it comes with three different heads, but since Jason Rusch is my favorite Firestorm (and not just because he’s the Black one), most of the shots will have his head. The figure also comes with two extra sets of hands in various positions, two atom-effect energy bursts, a ghostly head attachment of Professor Stein, and a energy burst that ends with a Ram’s head. Now let me jump onto my high horse a bit and rant. 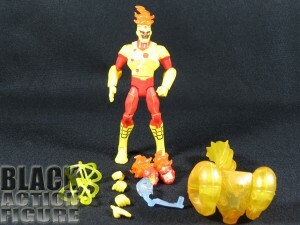 I’ve been following Firestorm since the early 1980’s. His main power is to change the molecular structure of any inorganic material (not sure if he can affect organic material, but I don’t believe that to be the case). You know, like turning ninja stars into balloons, that sort of thing. That being the case, I don’t ever remember him conjuring up a defined construct like a ram’s head out of thin air. 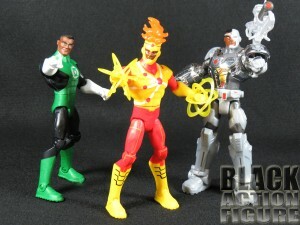 That’s more a Green Lantern (or associated Lanterns) power. That’s the first thing wrong with this. The second thing is that the ram’s head attachment is too damn big. Similar to the energy fist attachment that came with the Total Heroes John Stewart Green Lantern, this thing is way too big and too heavy to attach to the figure and to allow it to stay standing. You almost need a separate stand for the energy effect itself. 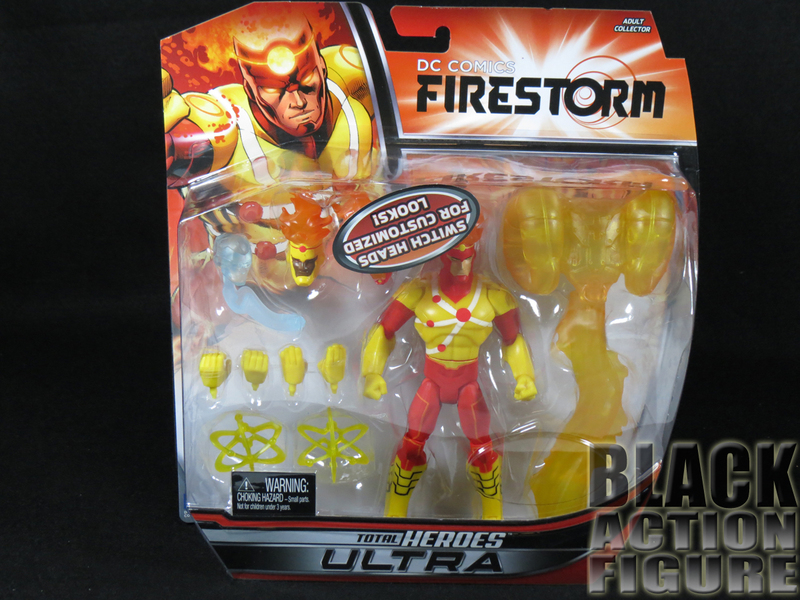 Since it is a yellow energy construct, I’m considering giving it to Sinestro. It just doesn’t make sense being part of this figure. 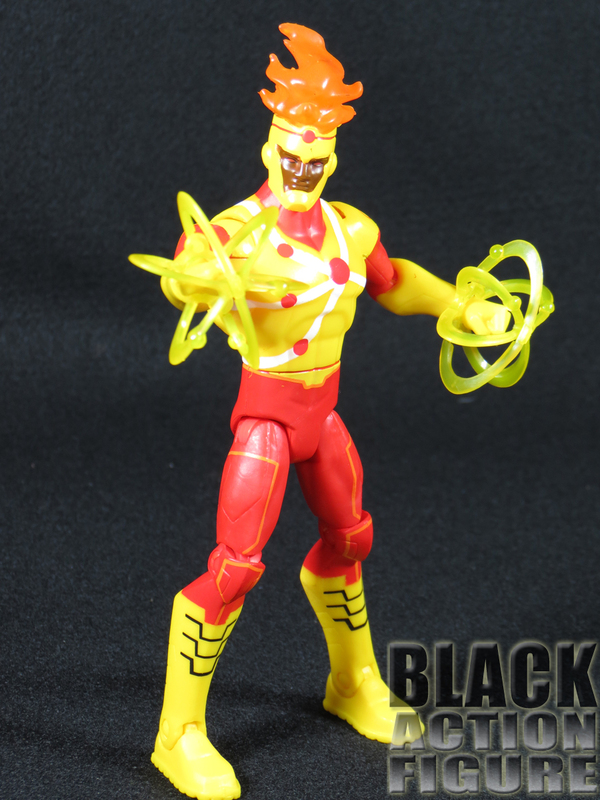 I’ll stick with the energy bursts which actually are pretty excellent in my opinion. I even like the disembodied floating ghost head of Professor Stein. But it was a HUGE miss with that ram’s head. In this section, I can’t really talk about the likeness since this is a fairly stylized version of Firestorm, but design wise it’s pretty accurate. I like the Jason Rusch head because he’s got this serious look to him like he’s about business. 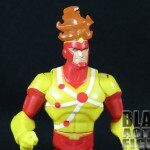 I also like the contrast of the yellow on his head as opposed to the red on the other two heads. 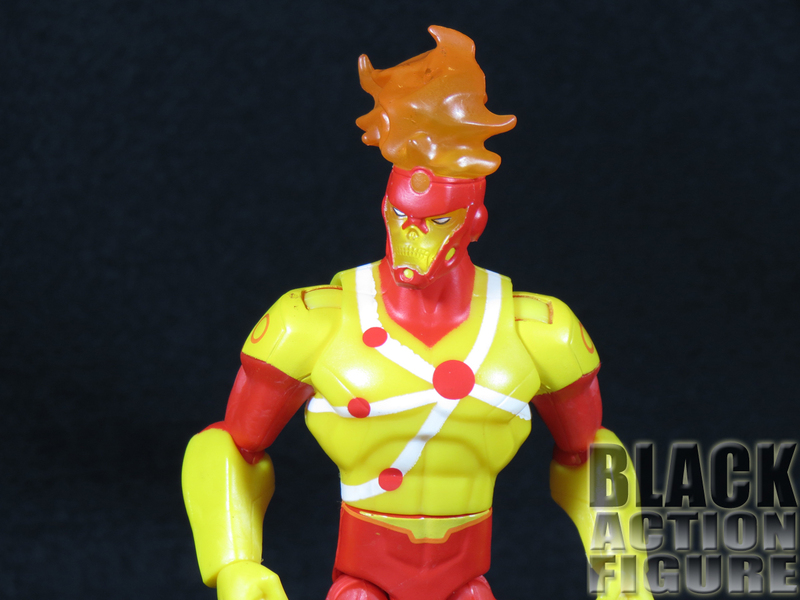 The Ronnie Raymond head is kind of goofy and the combined Firestorm head is actually a really good alternate sculpt and it’s also translucent which just adds to it. Taking a look closer at the paint application, I see that the paint was applied pretty sloppily. I’m never one to complain about paint usually, but just to see some of the unevenness of this work is kind of disappointing, especially since this line is pretty much a “paint by the numbers” type of figure, meaning it’s a flat paint with no distinguishing highlights, shadowing, or paint washes. So really, there should be no excuse. The rest of the sculpt of the figure is part of the basic body most of the Total Heroes line comes with. No surprises there. But like I’ve mentioned, Professor Stein is done well, so bonus points for that. Again, no surprises here. 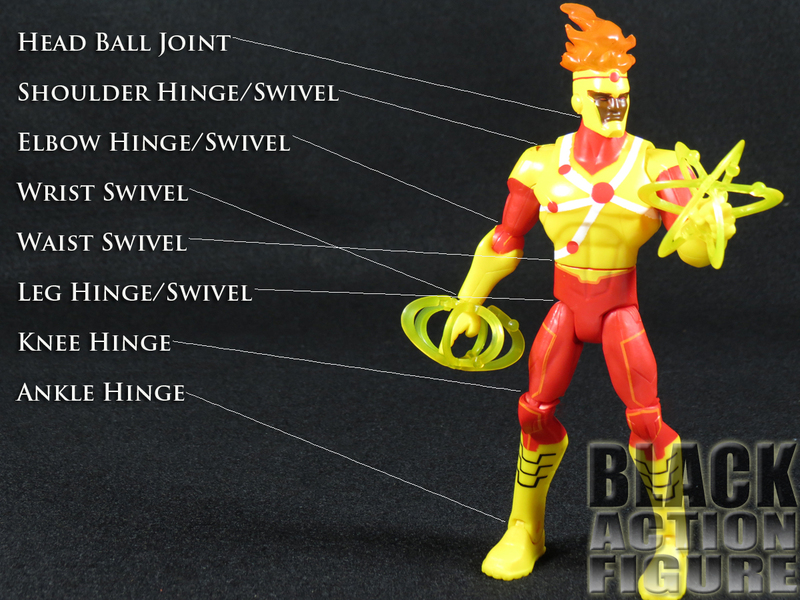 This figure has the basic 20+ points of articulation that almost all of the Total Heroes line shares. 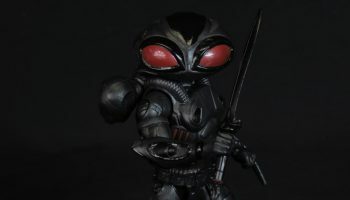 Unlike the Cyborg figure, there is slightly more range of motion in his head as he is able to look up and down somewhat. Other than that, good articulation, pretty basic, and nothing we haven’t seen before. 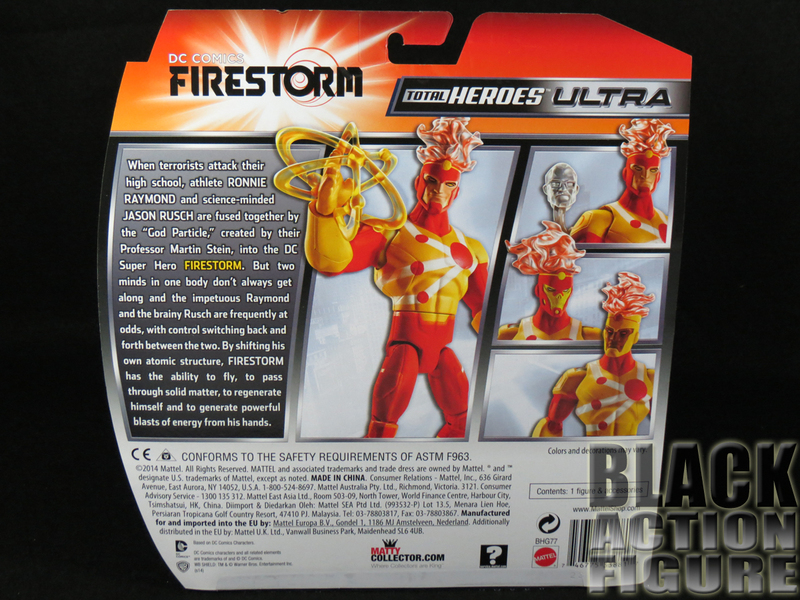 This figure came out to be so basic, unlike how I have felt about the other Total Heroes Ultra line. I think this one could have gotten away with just the Ronnie and Jason heads, the energy bursts and that’s it. It could have been placed in the regular Total Heroes line. This again calls into question the character selection for Mattel. They literally have all of the DC universe to play with and they limit it so much. 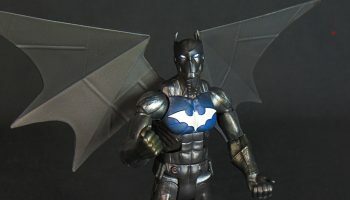 Don’t get me wrong, this is a cool figure and I love to have it in my collection, but there are others who deserve the Total Heroes treatment. Thankfully the line is continuing in its basic form (just “Total Heroes” …no more “Ultra”). 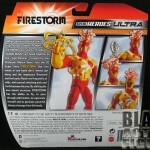 This was actually Mattel’s very last “Ultra” figure. I’m kind of sad to see it go, but they do what they have to do to stay afloat with DC in general. With Hawkman and Steel (getting reviewed next!) now in my collection, I can’t wait to see at New York’s Toyfair next month what will come out next. 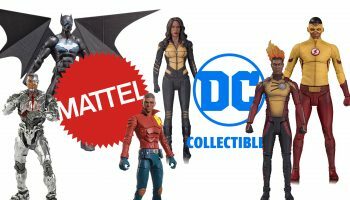 Women are definitely needed in this line (come on Wonder Woman, Vixen, and Cheetah! ).